Pets can now travel to certain countries as long as they hold a pet passport and meet all the requirements of the scheme. The Pet Passport - officially named The Pet Travel Scheme (PETS) was introduced on 28th February 2000. Cats, dogs and ferrets were then able to enter the United Kingdom without having to be quarantined in kennels for six months, which had been the length of time under the previous system. At first the number of animals travelling under this scheme was low but gradually as the system was understood and trusted by pet owner's the numbers increased. At the end of 2007 over 460,000 pets had entered the UK under the scheme. Although owners do take their pets on holiday the scheme has been widely used by dog owners travelling overseas to exhibit at dog shows without having to put their pets into quarantine upon return. Crufts dog show now has over 1500 dogs entered from overseas where previously they could not exhibit in the UK because of the quarantine rules. Dogs as far as the USA and Russia now make the trip increasing interest in the breeding of dogs from countries many dog owners would never have seen. Although pets can travel by road, rail, ferry and plane but they are not able to travel on every service. The list of companies offering pet travel is being updated regularly and it is advisable to check with your holiday booking agent before setting off to ensure that your favoured method of travelling with your pet is still available. Do not expect to be able to purchase a seat for your pet during the trip. In aeroplanes the pet will be secured in the hold in a suitable travelling container. He will be able to breathe easily as the container is designed for air to flow through. There will also be a water container. Sometimes the pet will travel on a different flight to the owners. 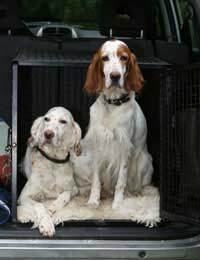 Ferry companies quite often have a special deck that the dogs can visit but on most occasions they will have to remain in the car. This is where a suitable cage or contained area in the car is favourable for the security and comfort of the pet. Train journeys through the channel tunnel are quick and the dog will hardly notice any difference to the journey as owners can stay with the animal during that part of the trip. You need to plan in advance if you wish to travel with a pet overseas as the dog, cat or ferret will have to be up to date with all his regular vaccinations. The pets also need to be micro chipped and have had the correct blood tests plus be wormed and protected against ticks. You need to allow at least six months for these procedures before travelling. Your vet can carry out all the procedures for the Pet Passport. If in doubt the Department for Environment Food and Rural Affairs (DEFRA) website holds full information on the latest travel procedures. Before returning to the UK your pet will have to be scanned and the microchip read before being allowed to board the plane or ferry. In the 24 and 48 hours before returning into the UK the pet must be vaccinated against ticks and tapeworms (echinococcus Multilocularis). This is done every time the pet travels. With careful planning and a little forethought your pet can accompany the family when they travel overseas.